It is 1961, Greenwich Village, New York City. 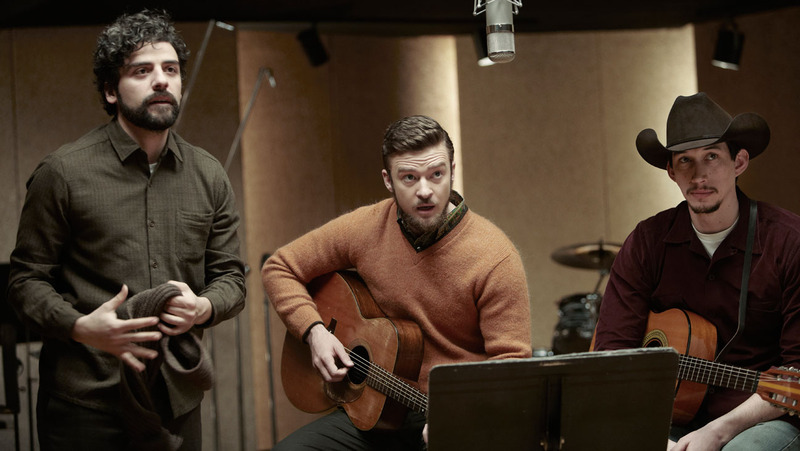 Llewyn Davis is a musician struggling to make it in the folk scene. He has management and a record label. He performs regularly at folk hot spot The Gaslight Café. However he is discontented. The reality is his record has not got him the attention he wants, he is not particularly sought after as a performer and he is sleeping on a succession of friends’ couches. However, this being a Coen Brothers’ movie, none of the above details is a spoiler. INSIDE LLEWYN DAVIS is seven days in the life of a man who believes, quite correctly that he has talent, but has no idea of how to capitalise on it. One of his fears is he might not be a success as a musician, but he is oblivious to all the obstacles that are holding him back. The movie is yet another emotionally-detached character study from the Coens, yet the reviewers who describe it as one of their warmer films have a point. This is a measure of how icy it can be in the Coen universe. The movie is also a beautifully shot, production-designed, performed and directed period piece. In American terms, the brothers work with peanut-sized budgets, yet the result is always visually stunning. They are often described as craftsmen. The astute reader may feel a ‘but’ is imminent and I would hate to disappoint you. INSIDE LLEWYN DAVIS received the Grand Prix when it screened at Cannes last year and the brothers remain critical darlings, whom many consider master filmmakers, BUT, for others they make films with unrelatable characters who go on journeys, where events happen but ultimately have no point. Such was my feeling about observing Llewyn Davis for a week of his life in 1961. Yes, the details are engaging, the Coens know how to present a world that draws you in, but I wasn’t sure why I should spend any time with the rather touchy Llewyn Davis. Oscar Isaac’s portrayal of the title character has justly attracted praise. It is a beautifully nuanced performance of a man who is thinned-skinned and sensitive to his own needs and almost completely closed off to the needs of others. The type Davis represents will be very familiar to most people. Isaac, who has a solid musical background, sings Llewyn Davis’s songs beautifully. It is here that we understand that despite his deficiencies of character, Llewyn is not a joke. The other performances are as good as we have come to expect from these filmmakers. John Goodman, Justin Timberlake, Carey Mulligan and F. Murray Abraham all do solid work in peopling this early ’60s folk setting. In a way, they are more like characters on the margins of Davis’s vision. The title is accurate, we are inside Llewyn Davis. We are trapped deep within his fears and inadequacies. If you have seen Coen films before and enjoy their subtle humour and wry observations of human nature, then they have another gift for you to enjoy. If you feel the Coens carefully create movies that are dense inaccessible in-jokes, then INSIDE LLEWYN DAVIS will not persuade you otherwise.